Borley Church is famous for being the most haunted church in England. 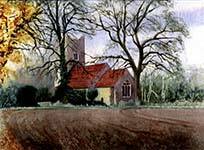 It is a view of Borley church not usually seen as it was painted from across the fields in autumn. ﻿Prints come in standard sizes starting at £25 (plus PP) for one that fits a 10x12" frame.